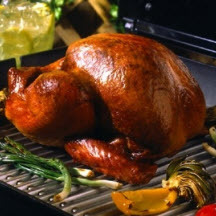 Grilled whole turkey served with a spicy molasses barbecue sauce seasoned with chile peppers. Cook and stir onion in oil in large saucepan on medium heat 4 to 5 minutes or until tender. Stir in garlic and jalapeño pepper. Cook 1 minute, stirring occasionally. Add ancho chile powder and red pepper. Cook 1 minute. Stir in tomato purée, water, ketchup, molasses, brown sugar, honey, mustard, vinegar, chipotle purée and salt; mix well. Bring to boil on medium-high heat. Reduce heat to low; simmer 25 to 30 minutes, or until sauce is reduced by half. Cool sauce. Remove 1 cup for using to brush onto turkey as it cooks. Cover and refrigerate remaining barbecue sauce to serve with the cooked turkey. Spray cold grates of outdoor grill with cooking spray. Prepare grill for medium indirect heat. Remove neck and giblets from body and neck cavities of turkey; discard or refrigerate for another use. Drain juices from turkey; pat turkey dry with paper towels. Turn wings back to hold down neck skin. Spray turkey with cooking spray. Place turkey, breast side up, on grill grate over drip pan. Cover grill with lid. Grill 2 1/4 to 2 3/4 hours, or until meat thermometer inserted deep in thigh reaches 180°F (82.2°C), brushing generously with the 1 cup barbecue sauce during the last 30 minutes of the grilling time. Let turkey stand 15 minutes before carving. Serve with the reserved barbecue sauce.